At the old place I had gotten a butterfly bush (Buddleia davidii) to grow, and it enticed numerous species to come by and pose for the camera. But for some reason, the soil in the yard of the new house is kinda weird and it’s hard to make anything thrive; numerous plants have started off well but then faltered and even died, and this included a butterfly bush and a salvia plant. We finally took the hint and have been keeping our most-wanted plants in pots, and they’ve been doing quite well. So there are three varieties of butterfly bush kicking it now in the front yard. And it didn’t take long at all to start seeing evidence of one expected resident. 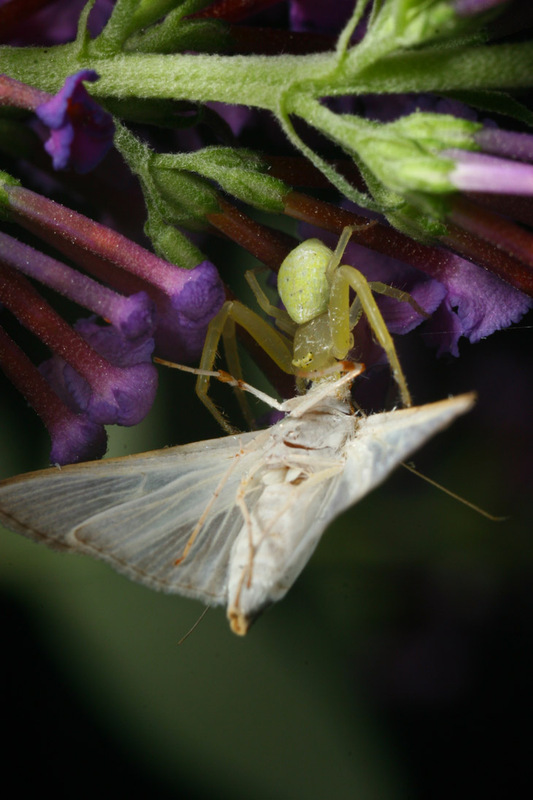 The more dramatic example was found one evening, as a small white moth, probably a Diaphania costata, was holding too still on one of the blossom clusters. Moths of this kind, while they will feed at night, are a bit twitchy and not inclined to remain motionless. Even from a short distance away, I could see the telltale detail that explained the lack of activity, not that it was really needed anyway. But maneuvering around to the opposite side and down quite a bit lower (actually lying on my back and shooting up at the underside of the blossoms) revealed the culprit, one of many that I’d been hoping to encourage. From this (awkward) angle it was easy to see the crab spider, in this case quite likely a white-banded crab spider (Misumenoides formosipes.) I always like these little ambush hunters, but they have a preference for certain flower species so I often don’t get to see them. But curiously enough, within a few days of getting the butterfly bushes at least one had taken up residence, which makes me wonder about the traits. Are there a lot more around that I never see because they haven’t yet found a hunting spot? Do they have really good eyes to distinguish the colors, or even a decent sense of smell to pin down ideal flowers? 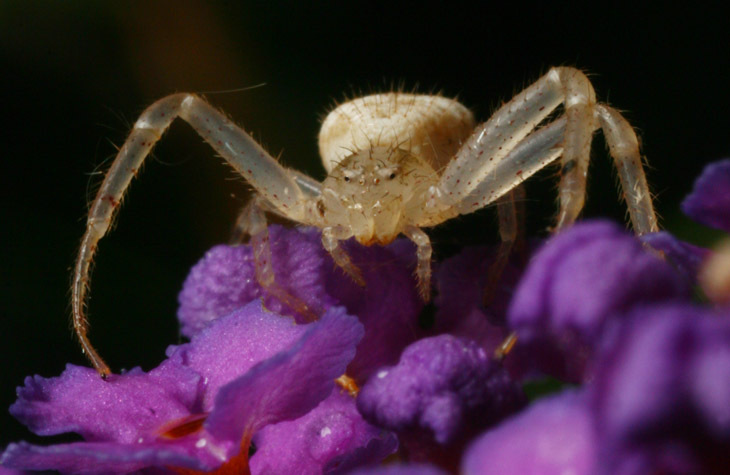 I have seen a crab spider with a meal several times now, and lurking among the blossoms even more often, but I’m not exactly sure if it’s the same one; all I can say is I have yet to see two simultaneously. This pic was from a few days earlier, before at least one high-calorie meal which could have changed the appearance, but I’m more inclined to say this is a different species, possibly genus Mecaphesa. 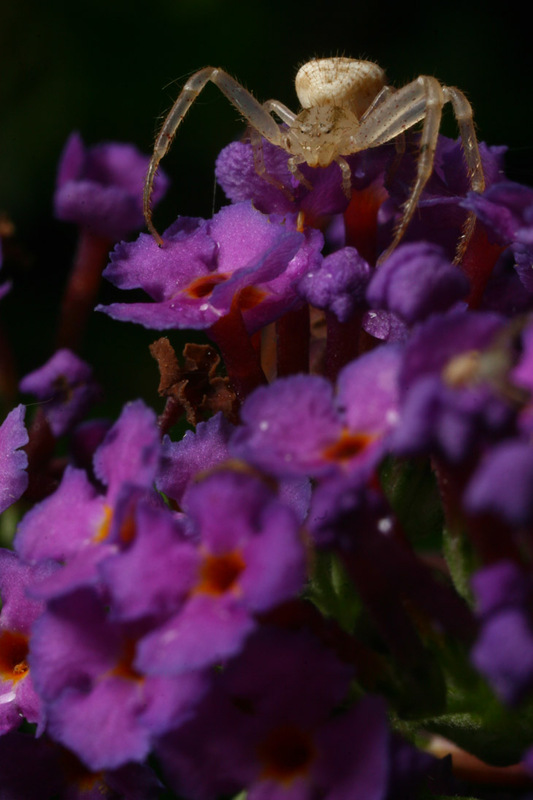 In many cases, crab spiders are colored to blend into the flowers that they hunt from, but that’s a tall order for something this vivid, and rather than strain something internally trying, I think these just give up and count on their prey being too oblivious to notice the glaring (in both meanings of the word) difference. And they seem to be right often enough. 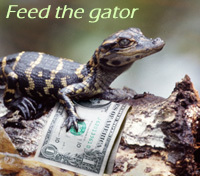 One more, because someone might be thinking I’ll do ‘cute’ someday. 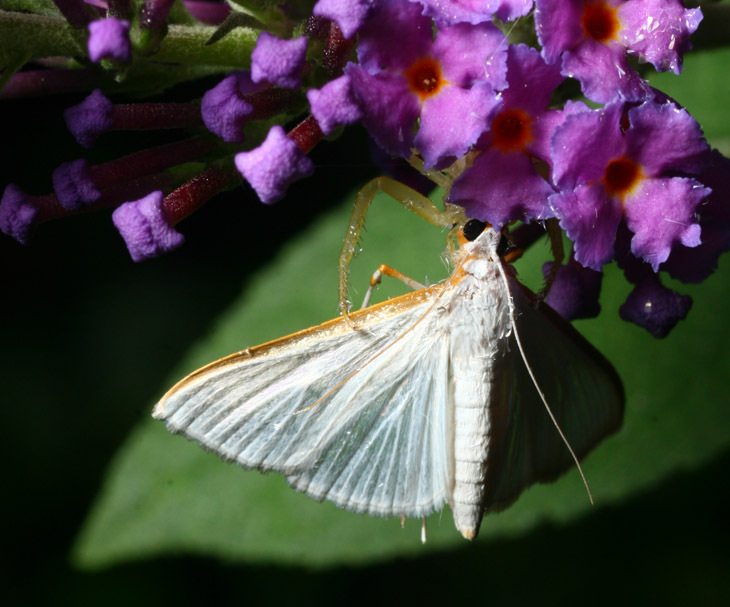 The butterfly bush has attracted more than spiders and careless moths, and more examples will be along shortly.